When Monticello, Minnesota, decided to build its community fiber network -- Fibernet Monticello -- it expected the incumbents to lower their prices and fight to keep subscribers. But Monticello had no idea the lengths to which they would go. The telephone incumbent, TDS, delayed the project for a year with a frivolous lawsuit and then built its own fiber-optic network while dramatically lowering its prices. We have yet to find another community in North America with two citywide FTTH networks going head to head. Because of the city's network, Monticello's residents and businesses have access to better connections than the biggest cities in Minnesota can get. Now, Charter has weighed in by cutting its rates to what must be below cost to gain subscribers. It reminded us of a shoot-out, so we created this infographic to explore what is at stake. Download a higher resolution PDF here. Charter has taken a package for which it charges $145/month in Rochester, Duluth, Lakeville, and nearby Buffalo (MN) and is offering it for $60/month - price guaranteed for 2 years. A Monticello resident supplied us with this flyer, which this person had received multiple times at their home over the course of a month. (See below for the full flyer). 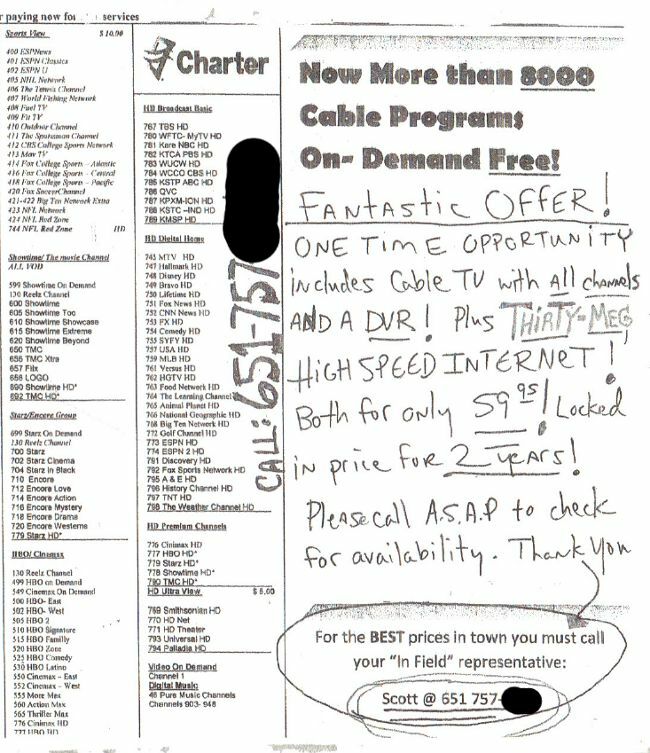 This is either predatory pricing or the cable industry is out of control with its rate increases. If that package costs Charter more than $60/month to supply, then it is engaging in predatory pricing to drive competitors out of the market. Consider that Charter may be taking a loss of $20/month ($240/year) from each household that takes this offer. They can do that by cross-subsidizing from nearby markets where they face very little competition. If that package costs $60 or less per month to Charter, then it has an incredibly high profit margin and the fundamentals of the market have to be questioned. Traditional economic theory tells us that very large profits anywhere will attract new market entrants. Yet the private sector refuses to provide competition aside from the common duopoly of DSL /cable. And these companies use their incredible lobbying power to push bills such as Minnesota HF 2695 that would ban communities from building their own networks. Unfortunately, building their own networks is often the only way for communities to create real competition and investment in next-generation networks. But communities then have to face dirty tactics from these massive companies bent on maintaining their marketshare using any means necessary. The aggregate benefit to Monticello is very large right now. Prices for telephone, cable, and broadband have all dropped, keeping millions of dollars in the local economy. But Fibernet Monticello has missed its revenue targets because TDS and Charter care more about driving competition out of town than a fair fight. The question is whether dirty tactics will successfully run Fibernet Monticello out of business, allowing TDS and Charter to resume gouging subscribers with their ordinarily high rates. If they do, it will be ironic that FiberNet Monticello, which brought the fastest residential speeds in the nation to a small Minnesota town while lowering the prices everyone pays for telephone, broadband, and cable, will be regarded as a failure.